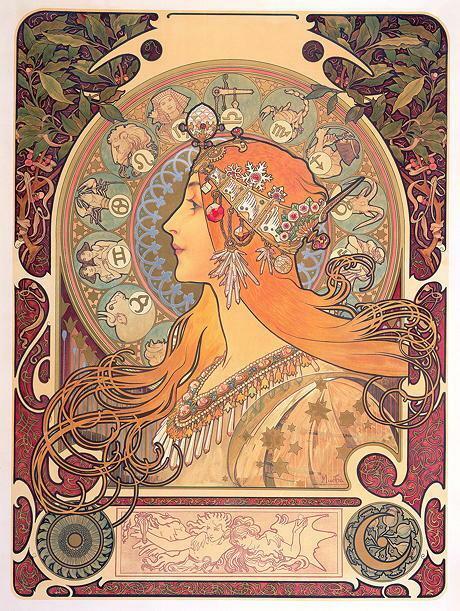 Alphonse Mucha, Le Zodiaque, 1896, colour lithography, 65,7x48,2 cm. Prague, Mucha Foundation. Mucha Trust 2018. PARIS – He is forever labeled the artist of his floral muses of Art nouveau. Indeed, the fame of Czech artist Mucha (1860-1939) is closely linked to his paper heroines, with cascading locks, ivory complexions, and endless flowing dresses. Sarah Bernhardt gave him his first break and made him famous overnight with the poster of the play Gismonda by Victorien Sardou. Mucha was a cosmopolitan, cultivated man: he lived in Paris for a long time, where Gauguin, his close friend, received him regularly in his atelier, had an office in New York, taught in Chicago and carried out a great number of documentary trips to the Balkans. Nevertheless, he never managed to rid himself of this cumbersome load. This exhibition, built in great part on the Czech fund of the Mucha Trust, enlarges his stature. For we discover he was a photographer, not hesitating to shoot nudes and carry out schoolboy pranks. But not only: he was an interior decorator, advertiser (for soaps and perfumes), and even designed stamps and banknotes. What he considered his masterpiece, the cycle of the Slav Epic, was not brought to Paris, and we can only regret not seeing more paintings. But we are presented with a significant number of examples of his main points of interest. The artist who celebrated ethereal beauty, women, and flowers, was arrested by the Gestapo following the invasion of Czechoslovakia, under cold gunpoint, and in total despair, died on 14 July. An ending as sad for an artist as it was for a continent. • Alphonse Mucha at the Musée du Luxembourg, from 12 September 2018 to 27 January 2019. Pablo Picasso, Woman with a Crow, 1904, gouache and pastel on paper, 65 x 49.5 cm, © Toledo Museum of Art © Succession Picasso 2018. PARIS - Picasso is relentless. While the musée Picasso in Paris has just inaugurated an exhibition simply called “Chefs-d’œuvre” (Masterpieces), the musée d’Orsay has focused on a fundamental period, the years 1900-1906. It opens with his first trip to Paris (in the fall of 1900 for the Universal Exhibition where he presented one painting), and closes with the gestation of another painting-manifesto (Les Demoiselles d’Avignon). These years can be easily summarized for the public at large by two periods that are now universally known. The blue period first of all, sad by nature since it was mainly inspired by the suicide of his friend Casagemas, and then the pink one, a priori gay. But it is not always like that, as Picasso often circumvents classifications and sticks to certain permanent points, such as his taste for eroticism. Prior to a yet more specialized retrospective to take place in the USA (on the blue period alone at Phillips Collection in Washington and at the Art Gallery of Ontario in Toronto in 2020), this exhibition will allow certain works to come back to France after a long absence, such as La Vie or Woman and Child on the Seashore. • Picasso. Bleu et rose at the musée d’Orsay, from 18 September 2018 to 6 January 2019. PARIS – This is a mythical place, in a country that is martyrized by an endless war. It has seen other dark days, but this war – which only touched it in the beginning (2013-2014)-, has never the less affected it. Its name comes from the Kurds (Hisn Al-Akrad, or the “fortress of the Kurds”), and it is reaching its second millennium. It was first used by the Romans, was then taken over by the Crusades in 1099 and would remain under the thumb of the Christians of the Orient (in particular the Hospitaliers) until 1271, when it fell to the Sultan Baybars. The Crac was once again in the European limelight in the 20th century when Syria was under French mandate and that T.E. Lawrence defined it as “the most beautiful castle in the world”. The exhibition traces this particular link with France (who bought it in November 1933 and restored it) and the problems for its conservation given the current situation. • Le Crac des Chevaliers. Chronique d’un rêve de pierre at the Cité de l’architecture et du patrimoine, from 14 September 2018 to 14 January 2019. NEW YORK – In these times when the theory of a conspiracy has become ubiquitous and perverts our vision of reality, this exhibition shows that it is not a new trend. With the development in the 20th century of Western bureaucracies, and in parallel, of the electronic universe and of files on everything and everyone, artists plunged delightfully, a long time ago, into this grey zone, unveiling rue and false conspiracies. Whether it is to unveil the links between politicians and the Mafia, the habits of real estate moguls, or the secrets of weapon dealers, artists have focused for some time on unveiling the secret networks of power, like Mark Lombardi with his surprising diagrams, or the civilization of generalized surveillance with Trevor Paglen and his installations. Others have invented parallel worlds where facts (hard facts, as the Americans say) and dreams mix subtly, as with Jim Shaw or Peter Saul. The two schools are brought together here and it will not be easy to make the difference between true from false. • Everything is Connected. Art and Conspiracy at the Met Breuer, from 18 September 2018 to 6 January 2019. A member of the Magnum agency since 1981, and known in particular for his images of Morocco, Harry Gruyaert (born in 1941), has another passion, shores. That includes shores on the ocean, the sea or rivers. This anthology was first published in 2003 and has been enriched since. It presents the quintessence in a minimal form: a small introduction by Richard Nonas, a mythical artist of landscapes, and captions reduced to a thread. This is a way of saying, and we can only agree, that images suffice themselves. From 1973 (Badwater, California) to 2016 (the Opal Coast), nearly half a century of photographs carry us from Ostende (Gruyaert is Flemish) to Berck-Plage, from Biarritz to Zanzibar. The promenade starts at Fort-Mahon, on a bright beach with happy bathers, and it ends on a horizon in Nice in 1988, empty and full of dark clouds. One is tempted to see a symbolic and subliminal warning on the way our world turns.